Synonyms: DanMachi, Dungeon ni Deai wo Motomeru noha Machigatteiru darouka, Is it wrong that I want to meet you in a dungeon?, Can't I Expect A Chance Encounter In The Dungeon? Published: Aug 2, 2013 to ? The huge labyrinth city, Orario, is the gateway to the huge underground maze commonly known as the "Dungeon." Its strange name causes excitement, a place to gain honour, and maybe even a romance with a pretty girl. A place where people hold their breath, hoping to gain all they wish for, a place where a solitary young man meets a little "god." "Alright, Bell-kun, follow me! It's time for the "Familiar" initiation rite to happen!" "Yes! I'm going to get stronger!" The fated meeting of a boy who wants to become an adventurer, and the failed god who doesn't even have a single follower. This boy's journey as written by the goddess, "Family's Legend" (Familiar's Myth). Dungeon ni Deai wo Motomeru no wa Machigatteiru Darou ka has been published in English as Is It Wrong to Try to Pick Up Girls in a Dungeon? by Yen Press since May 19, 2015. It has been licensed in Spanish by Norma Editorial. Being a novice adventurer is difficult, full of surprises, especially if you're trying to level up and become a better adventurer. However, this may deem to be awkward and embarrassing if you by chance one day are battling monsters, but get stuck into predicament, resulting in being saved by the girl you like, and then turning into a red tomato and running away. If that isn't bad enough, try being bad-mouthed and made fun of by the same girl's companions before your own eyes. Try being Bell, the protagonist of this manga. All he wanted was to go into the dungeon, fall in love, gain honor and live happily. Instead, Bell, the protagonist of the manga, is a novice adventurer like any other, with a familia and a goddess he contracted with. However, after the mentioned incident above, he develops a special skill, much different from other adventurers and starts undergoing a huge change. As changing and becoming a stronger person is something everyone wants to do, of course, it won't be easy as you have to overcome obstacles and challenges along the way, much as what Bell had to face. Alongside with his familia (which only consists of him and his kami-sama, Hestia) he faces a long road ahead of becoming a great adventurer. The art of this manga is simple, not so complicated, and that's something I like about this manga. However, I do believe that they should start adding more detail into the battle scenes of the manga; 1 strike and then the monster dies is not as so sufficient and satisfying for readers of this manga. Everything else is good, especially the character design, as it is simple and not complex like others, it really matched with the theme of this manga. A nice feature to this manga. Character, being a crucial component in striving to become stronger is something that this manga portrays well, but could do a better job in. Bell- The main character. He is a novice adventurer, a soloist in Hestia's familia (after all, he's the only one in her familia), and hoped only to become an adventurer in hopes of gaining honor, live happily, and perhaps have a woman. But being a novice adventurer, this task may take a lot of effort, time, and work. As it proves difficult to Bell, suddenly, life changes for him, and he ends up meeting someone that makes life change for the worst, but then luck comes for him and so does a new skill. He becomes exceedingly strong, and has a lot more potential in the future to change and become better. He is rather reckless, as seen in the above incident. He starts off as a coward, but as the story goes further along, you can't help but notice his remarkable change. You can really see his change, he started off as a weak boy, but becomes stronger after overcoming a lot of obstacles and falling in love. Hestia- The goddess of her familia which consists of only her and Bell. She is in love with Bell, and wants to support as so much as to begging fellow goddess Hephatesus to create a weapon for him. She works many odd jobs to support her familia, and has to do more after getting Bell's weapon. She is often referred to as the "big-breasted loli goddess". She is a bit reckless as seen in the incident in the monster feriae, but above all, she is caring and she is in love, so she wants to do things for the one she loves. A good manga, you'll definitely enjoy it as much as I enjoyed it. It has a lot of good qualities about it, but there is no actual "perfect" manga, so this would be a considerable "imperfect" manga that you should read. 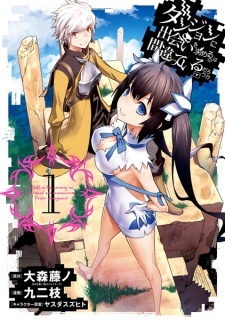 Overall the manga was a great read for me, you'll definitely enjoy it if you like MMORPG genre, and fantasy mangas. It has a lot of depth, and a lot of action scenes and such. You should try it out, it's very good, and has much potential to become a better manga. I know it is going to be a problem for some for me to rate this so high. For at first it both sounds and seems like another generic harem anime. The thing is, it capitalizes upon their genre very well. It literally starts off with his grandfather telling his grandson to become an adventurer just so he can pick up women. From a humor standpoint, it is hilarious. Albeit not so much a modern societal standpoint. There were a few things that irked me about this series as far as continuity and slightly storybreaking plot elements. I can't say directly what they are without entering spoiler territory, so I'll leave it at that. The presentation, the capitalization on the genres and tropes are on point, and throughout the time I was watching it, I could find enjoyment in everything they were presenting. The art was aesthetically pleasing to the eye. I gave it a ten based on these aspects, and feel free to message me if you want more details. I'm not going to lie by the way. An ancillary point, Hestia is bestia. I whole heartily agree with Chierii. The Character element is done perfectly in this series. The anime did a great job bringing the characters to life. Bell-san has it rough being a level 3 rookie. Although he is kinda oblivious to why he leveled up so fast. However, this doesn't deter Bell from his determination and convictions. He will do what it takes to protect his familia and catch up to Ais Wallenstein. Being popular with the ladies is great for Bell, although bad for Hestia, which makes Dungeon Ni a lot of laughs, full of feels and drama. I want the anime to be dubbed soon. Unless it is and i can't find it. I recommend reading this and watching the anime adaptation. You might like both.